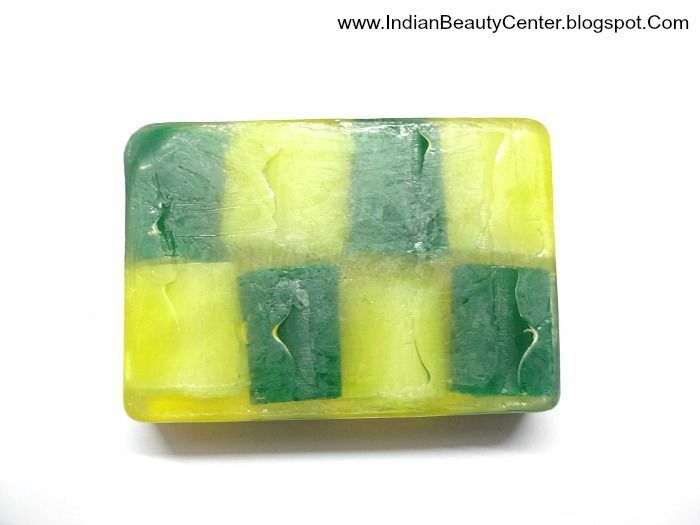 Product Description : Natural handcrafted soap is a luxurious tool in keeping your skin healthy. With its creamy lather, wonderful fragrances, and now affordable prices, pampering yourself has never felt so good. Its popularity is growing rapidly as a chemical free alternative to conventional soaps. Lemon as Ingredient, Purely natural, Handmade glycerine Soaps, Contains Anti-Oxidants. Shelf Life : 24 months from Mfg. Ingredients : No mention of it anywhere! It comes in a outer paper covering that mentions details regarding the soap. 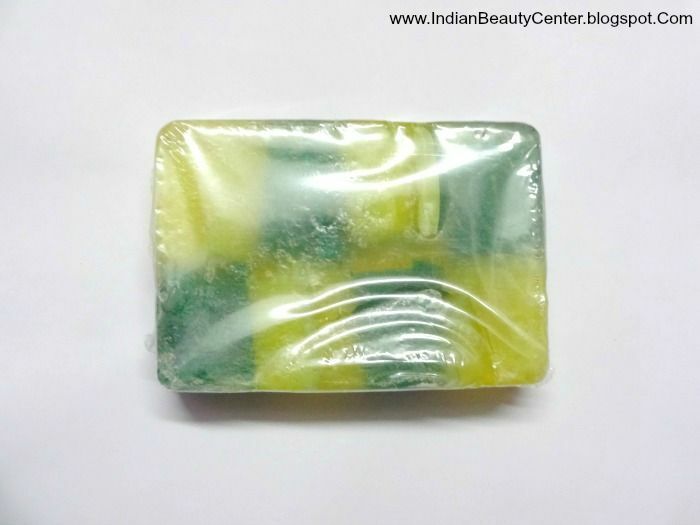 The soap is nicely wrapped in a thin plastic sheet to maintain hygiene. So, the soap looks fantastic! 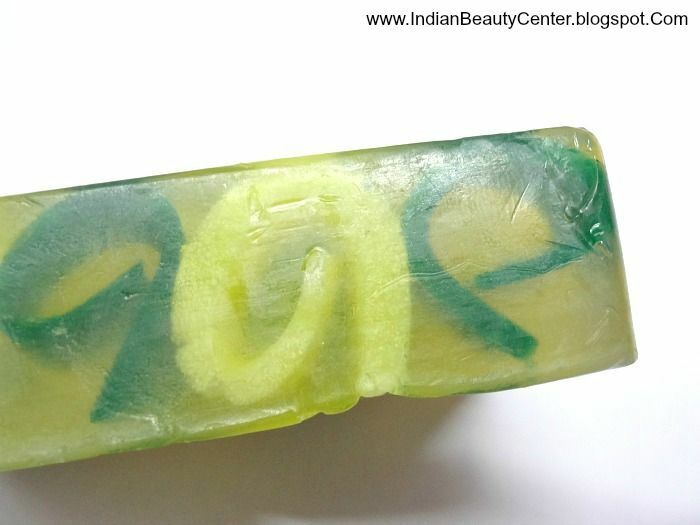 It has deep yellow and dark green soap sheets rolled in the light yellow glycerine soap. 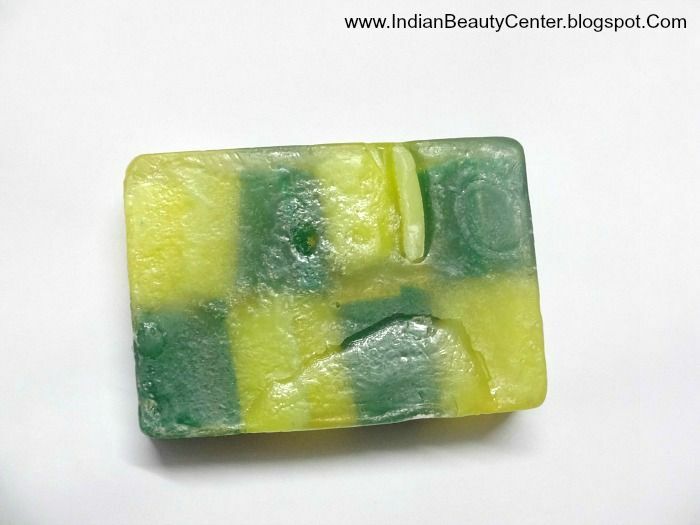 The soap is very attractive to look at and the yellow and green colors give you an idea that it contains lemon and that the fragrance would be citrus-y. The soap has the exact fragrance of my favorite The Nature's Co. Lemongrass Foot Spray. It has citrus notes with lemongrass fragrance and a little soapy touch to it too. I like the fragrance and I am sure all citrus lovers would find it to their liking. The bar is big enough, and the 100 grams bar is a little expensive, but for the cuteness and size, and all the effort that goes into hand-making it, it's justified. The soap lathers really well and I just need a couple of swipes to get build up that rich lather. 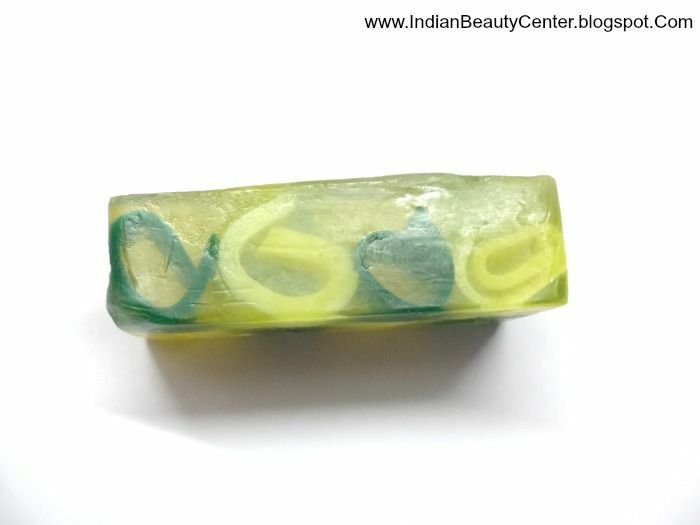 Also, the translucent soap melts relatively slower than other glycerin soaps in India. Thus, it lasts for more than 1.5 months for me! Moreover, it cleanses the skin really well and removes all oil and dirt efficiently. It does not over-dry the skin , yet, I need my body moisturizer immediately after. When I received the soap, I was curious to know what those roll on sheets are. So, let me break it with you. Those are nothing but soap sheets put into the glycerin soap. It melts along with the soap and the soap stays smooth always. Nothing pokes out of the soap, if you ask! The fragrance is strong but it does not linger onto the skin at all. Just 3-4 minutes and it vanishes. It's a good thing for this soap as I would not like to smell overtly citrus-y after a bath. Another thing that I would like to pin-point is that the ingredients list is not mentioned. They have just written that it is a natural soap. I wish they add a complete ingredients list along with the base of the soap, so that I know what I am putting on my skin. 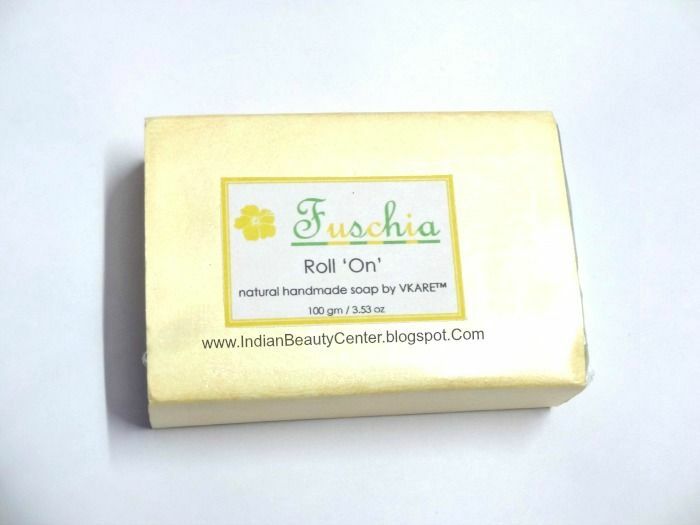 Overall, for a soap, this does a very good job for me and I would love to try more Fuschia products as they seem really promising. Final Verdict : If you are really into soaps now like me, then this is going to be a very good option. It works well for me, but don't forget to moisturize after using this. I love citrus notes and so, I like this as well. Just that they should mention the proper ingredients list. 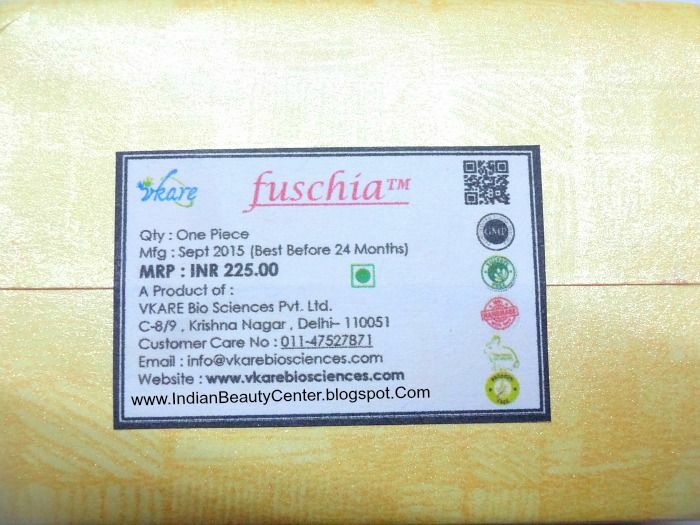 Overall, I like this soap and fuschia is a really good brand, I must say. They make some really good handmade soaps in India! I like the soap. I am into natural soaps & would love to try this. Since ingredient list is missing I do not know to take the dive or not. :) well reviewed. The soap sounds very impressive. Love the checkered pattern.